Psychologically, the mulatto is an unstable type. In the thinking of the white race, the mulattoes generally are grouped with the backward race and share with them the contempt and dislike of the dominant group. Nowhere are they accepted as social equals. The discrimination varies all the way from the more or less successfully concealed contempt of the Brazilian white for the socially ambitious metis, to the open and bitter hatred of the South African for the "coloured man" and the Native boy, but it seems to be present everywhere. The origin of the half-castes was everywhere an irregular one; this is a point about which prejudice can always center. Their nearer approach in physical appearance to the white type is simply taken as evidence of additional irregularities in ancestry. The two things-the lower ancestry and the presumption of a dubious origin-are the focal points about which the white man's contempt for the mixed-blood group centers. By the native race, the mixed-blood group is generally accepted as superior. The possession of white blood is an evidence of superiority. The ancestral blot excites no prejudice. The mulattoes are envied because of their color and enjoy a prestige among the darker group because of it. Between these two groups, one admiring and the other despising, stand the mixed-bloods. In their own estimation, they are neither the one nor the other. They despise the lower race with a bitterness born of their degrading association with it, and which is all the more galling because it needs must be concealed. They everywhere endeavor to escape it and to conceal and forget their relationship to it. They are uncertain of their own worth; conscious of their superiority to the native they are nowhere sure of their equality with the superior group. They envy the white, aspire to equality with them, and are embittered when the realization of such ambition is denied them. They are a dissatisfied and an unhappy group. It is this discontented and psychologically unstable group which gives rise to the acute phases of the so-called race problem. The members of the primitive group, recognizing the hopelessness of measuring up to the standards of the white race, are generally content and satisfied with their lower status and happy among their own race. It is the mixed-blood man who is dissatisfied and ambitious. The real race problem before each country whose population is divided into an advanced and a backward group, is to determine the policy to be pursued toward the backward group. The acute phase of this is to determine the policy to be adopted toward the mixed-bloods. To reject the claims and to deny the ambition of the mulattos may cause them to turn back upon the lower race. In this case, they may become the intellectual leaven to raise the race to a higher cultural level, or they may become the agitators who create discord and strife between the pure-blood races. To form them into a separate caste between the races, is to lessen the clash between the extreme types and, at the same time, to deprive the members of the lower race of their chance to advance in culture by depriving them of their natural, intellectual leaders. To admit the ambition of the mulattoes to be white and to accept them into the white race on terms of individual merit, means ultimately a mongrelization of the population and a cultural level somewhere between that represented by the standards of the two groups. Sarah Griffin welcomes Zélie Asava‘s book that applies divergent theoretical concepts of Irishness, whiteness, gender and the particular place of the ‘other’ to the ‘conceptual whiteness of Irishness itself’. In this article, I critique some of the discursive terms in which blackness is folklorized and celebrated institutionally as part of the nation in Puerto Rico. I examine a government-sponsored housing project that meant to revitalize and stylize the community of San Antón, in Ponce, as a historic black site. Although government officials tried to preserve what they considered to be traditional aspects of this community, conflict arose because not all residents agreed with this preservationist agenda. I document the controversy, linking the government’s approach to racial discourses that represent blackness as a vanishing and distant component of Puerto Rico. I argue that this inclusion and celebration complements ideologies of blanqueamiento (whitening) and race-mixture that distance blackness to the margins of the nation and romanticize black communities as remnants of a past era. I link these dynamics to modernizing State agendas and discourses of authenticity that fuel cultural nationalism worldwide. In March 1995, The San Juan Star, one of Puerto Rico’s leading newspapers, announced that “Puerto Ricans will ‘bleach away’ many of the physical traces of its African past by the year 2200, with the rest of the Spanish-speaking Caribbean following a few centuries later” (Bliss 1995:30). The article, which was written to commemorate the 122nd year anniversary of the abolition of slavery on the island, also seemed to be commemorating the future “abolition” of blackness itself, “in two centuries.” said one of the experts interviewed, “there will hardly be any blacks in Puerto Rico” (historian, Luis Diaz Soler, in Bliss 1995: 30). The concept of race has had a significant influence on research in human biology since the early 19th century. But race was given its meaning and social impact in the political sphere and subsequently intervened in science as a foreign concept, not grounded in the dominant empiricism of modern biology. The uses of race in science were therefore often disruptive and controversial; at times, science had to be retrofitted to accommodate race, and science in turn was often used to explain and justify race. This relationship was unstable in large part because race was about a phenomenon that could not be observed directly, being based on claims about the structure and function of genomic DNA. Over time, this relationship has been characterized by distinct phases, evolving from the inference of genetic effects based on the observed phenotype to the measurement of base-pair variation in DNA. Despite this fundamental advance in methodology, liabilities imposed by the dual political-empirical origins of race persist. On the one hand, an optimistic prediction can be made that just as geology made it possible to overturn the myth of the recent creation of the earth and evolution told us where the living world came from, molecular genetics will end the use of race in biology. At the same time, because race is fundamentally a political and not a scientific idea, it is possible that only a political intervention will relieve us of the burden of race. A Klee painting named Angelus Novus shows an angel looking as though he is about to move away from something he is fixedly contemplating. His eyes are staring, his mouth is open, his wings are spread. His face is turned toward the past. Where we perceive a chain of events, he sees one single catastrophe, which keeps piling wreckage upon wreckage and hurls it in front of his feet. The angel would like to stay, awaken the dead, and make whole what has been smashed. But a storm is blowing from Paradise; it has got caught in his wings with such violence that he cannot close them. The storm irresistibly propels him into the future to which his back is turned, while the pile of debris in front of him grows skyward. This storm is what we call progress. We rarely appreciate the presence of history in our day-to-day experience. The quotidian is a mixture of the repetitive and the predictable, carried forward by habit and punctuated by random events that we regard as either good or bad fortune. But in a more reflective mood, we have to acknowledge the relentless force of history that holds us in its grasp and accept that it creates the possibilities we use to negotiate with the future. The imposition of racial categories on human populations has been one of the most enduring historical forces that sets limits on opportunity and thereby shapes our life trajectory. As a projection of the underlying power relationships onto individuals, racial categories are used to structure social inequality. These power relationships are manifested both in the belief system that rank orders intrinsic human qualities according to group membership and the social institutions that enforce this hierarchy by restricting access to wealth, education, and other social goods. This daily reality is central to the history of all modern societies. The racial structuring of society also has pervasive influence on biological research and the patterns of health and disease. Enormous effort has been expended to describe human demographic history through reference to an ever-changing array of constructs and categories, all of which include a hierarchical arrangement—either explicit or implicit. In the United States, most prominently, public health has embraced racial/ethnic categories as fundamental structural elements. Clinical medicine has similarly evoked racial categories to explain causation and outcomes across the entire spectrum of diseases. At the same time, race has met some of the strongest challenges to its legitimacy in biology and biomedicine. All of biology is grounded in the theory of descent from a common ancestor. The belief in racial categories was one of the most powerful liabilities of pre-modern biology and lent credence to the established view of divine creation. Indeed, it has recently been argued that the challenge to race brought by the abolitionist movement was a key factor behind Darwin’s transformative insight that the biological world—on the evolutionary time scale—is a single indivisible whole (Desmond and Moore 2009). Biomedicine still grapples with the implications of that insight for our species, yet substantial progress—uneven, tentative, and ultimately disappointing—has been made. In the current era, genomic science has opened new vistas onto previously unobserved dimensions of biology, and that proportion of the concept of race that has been attributed to genetics can finally be subjected to empirical scrutiny. Integrating this new knowledge into practice and focusing the technology on socially productive work, as always, remains our most difficult challenge. The narrative of race therefore wanders the border territory between what we call science and what we recognize as history and politics. In the pre-genomic era, there was no requirement—indeed, no opportunity—to validate the authority of race with molecular evidence; causal inferences were made on the basis of phenotype, in its broadest possible sense, from disease to accumulated material wealth to social graces. The primary purpose of the race concept was to serve as a shortcut, an organizing tool that allowed post-enlightenment Europe to explain—and thereby justify—how imperialism had reshaped the world. Consequently, for both the social and biological sciences, race felt like the rude cousin whose claim on our affection was based on obligation, not choice. In every historical period, an incremental struggle has been waged to overcome the disruption that this unwelcome intruder has caused within empirical scientific disciplines. The election of Barack Obama as the 44th president of the United States has opened a new chapter in the country’s long and often tortured history of inter-racial and inter-ethnic relations. Many relished in the inauguration of the country’s first African American president — an event foreseen by another White House aspirant, Senator Robert Kennedy, four decades earlier. What could have only been categorized as a dream in the wake of Brown vs. Board of Education was now a reality. Some dared to contemplate a post-racial America. Still, soon after Obama’s election a small but persistent faction questioned his eligibility to hold office; they insisted that Obama was foreign-born. Following the Civil Rights battles of the 20th century hate speech, at least in public, is no longer as free flowing as it had been. Perhaps xenophobia, in a land of immigrants, is the new rhetorical device to assail what which is non-white and hence un-American. Furthermore, recent debates about immigration and racial profiling in Arizona along with the battle over rewriting of history and civics textbooks in Texas suggest that a post-racial America is a long way off. What roles do race, ethnicity, ancestry, immigration status, locus of birth play in the public and private conversations that defy and reinforce existing conceptions of what it means to be American? This book exposes the changing and persistent notions of American identity in the age of Obama. 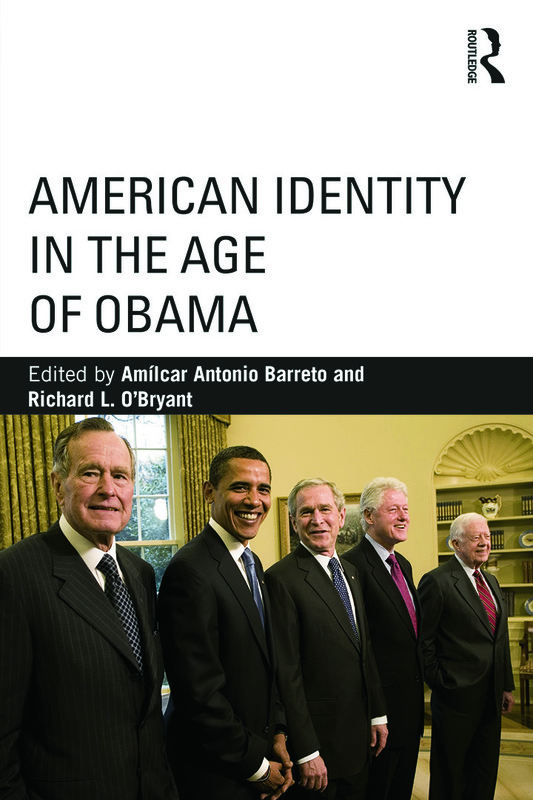 Amílcar Antonio Barreto, Richard L. O’Bryant, and an outstanding line up of contributors examine Obama’s election and reelection as watershed phenomena that will be exploited by the president’s supporters and detractors to engage in different forms of narrating the American national saga. Despite the potential for major changes in rhetorical mythmaking, they question whether American society has changed substantively. John Woodford, “A New Look at an Old Notion: Lawrence Hirchfeld Discusses Race in Society,” Michigan Today, (June 1996). http://www.ns.umich.edu/MT/96/Jun96/mta1j96.html. [Yaba] Blay’s work is also an excellent example of how one can be both a scholar and an activists at the same time and be successful at both. Scholars are sometimes (inappropriately) criticized for being activist at the same time they are scholars. More and more often it is accepted and embraced they not only can we be both but that we should be both: that being passionate about what we write about makes for better scholarship. [Yaba] Blay’s work is also an excellent example of how one can be both a scholar and an activists at the same time and be successful at both. Andrew Joseph Pegoda, “(1)ne Drop: Shifting the Lens on Race: A Review and Reflection,” Andrew Joseph Pegoda, A.B.D., (November 23, 2013). http://andrewpegoda.com/2013/11/23/1ne-drop-shifting-the-lens-on-race-a-review-and-reflection. Comments Off on [Yaba] Blay’s work is also an excellent example of how one can be both a scholar and an activists at the same time and be successful at both. In this insightful and well-written ethnography, Nadine Fernandez explores a central paradox: if mestizaje (racial mixing) is the “essence” of the Cuban nation, then why are interracial couples, the purported “engines of mestizaje” (184), still perceived with disdain? Why are interracial couplings – particularly those between black and white Cubans – so infrequent and often met with resistance? A deeply historical and ethnographic account, Revolutionizing Romance advances the compelling argument that “nowhere is race more salient than in romance” (50). Moreover, Fernandez argues that the conflicts surrounding interracial relationships actually highlight “the ideological aspects of racism at work” (53). In this documentary, Henry Louis Gates explores the extent to which the notion of being a racial paradise applies to Brazil. He introduces Brazil’s contradictions of being the last country to abolish slavery’ in the New World in 1888, yet the first to declare that it was free of racism. He explores a variety of cities in Brazil in order to understand the history of early race mixture, contemporary valorization of Blackness, and attempts to address racial inequality. As a viewer, we watch how Gates’ fascination with the Brazil’s African heritage and race mixture at the beginning of the film turns into a questioning of the myth of racial democracy. The film is useful in terms of providing a primer on race in Brazil for novices on race in Latin America. Geared towards the general public, this is a film that could be used in an introductory course for undergraduates about race in Brazil or Latin America more broadly. Its strengths are in illuminating the nature of slavery and race mixture in Brazil’s history while introducing the racial ideologies of whitening and racial democracy. Gates introduces scholars such as Manoel Querino and the more renowned Gilberto Freyre to discuss their scholarship on black contributions to Brazilian society. Gates’ film also has vibrant images of Carnaval, capoeira, and a Candomblé ceremony, providing opportunities for students to gain exposure to these African-influenced cultural practices. As director of Emory’s Ethics and the Arts program — and a lifelong photographer and filmmaker — Carlton Mackey is used to exploring the questions that intrigue him through an artist’s lens. …Emory Report caught up with Mackey to discuss the evolution of “50 Shades of Black,” which will be the focus of a public exhibition at the Center for Ethics next February. …How did you come up with the idea for the “50 Shades of Black” project? Before I had my son Isaiah, I’d never dated anyone who didn’t look like me. But I fell in love with my wife (Kari, who is white). When I was going to become a father, I started having these questions: What is this kid going to look like? Is he going to identify with me? Am I going to identify with him? Is he going to be black? What is blackness?